The British Waterfowl Association (BWA) will present its 27th National Championship Waterfowl Exhibition on Sunday 26th October 2014 at Moreton Morrrel near Warwick. The exhibition provides a rare opportunity for visitors to view hundreds of ducks and geese as well as receive advice from BWA members. If you are looking to buy stock, this is an excellent opportunity to do so. I have always found sale pens always offer excellent value for money; the quality the birds is high and they are reasonably priced. The show is held at Warwickshire College which is easy to get to from junction 12 of the M40 (postcode CV35 9BL for your Sat Nav) and opens to the public at 10am. Entrance costs £2.50. There are full catering facilities, including cooked breakfast. Rupert and I will be there to take photos of the price winners. We hope to see you there! 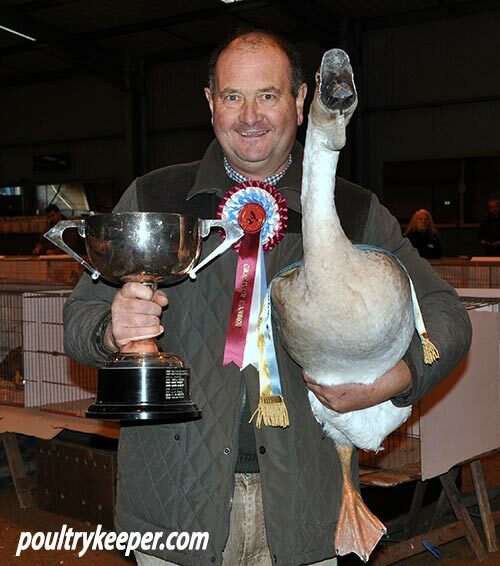 Pictured above: Richard Hedges and his award winning African Gander at the 2013 show.